Bridgewater, New Jersey - Just in time for Halloween! 288 Vroom LLC has announced 100 Horror Stories, Sounds, And Scares 4.2, a terrifyingly cool update to their year-round top selling iPhone app. This is the second major update in a matter of a few weeks. In addition to the recent update that added pranks that will scare your friends out of their minds, 4.2 added 20 brand new haunting sounds giving the app a total of over 40 sounds that will make your Halloween even creepier (and a few that will make it funnier). iPhoneFootprint said, "100 Horror Stories, Sounds And Scares is the scariest book app on the iPhone ... I must say that it is one of my favorite book applications." The STORIES are some of the greatest fright fests of all time by some of the greatest authors of all time, including Ghost Stories, Tales Of The Supernatural, Classic Gothic, Vampires, Werewolves, Monsters, and so much more. Poe, Stoker, Shelley, Twain, Dracula, Frankenstein, Jekyll and Hyde, Sleepy Hollow, and the list goes on. There is a current total of 100 short stories, novellas, and full-length novels. It's an entire Halloween library right on your iPhone, iPod touch, or iPad. The SOUNDS are not your kids' sound effects. The high-quality sounds of thunderstorms, screams, ghostly music, things that go bump in the night will set the perfect mood for a good horror story and Halloween night. There is a current total of over 40 Sounds that can be played while reading or anytime. Plus there's a few that will give you and friends a good laugh. In addition to some of the greatest horror and ghost stories of all time, haunting sounds that will creep you out, and terrifying surprises, 100 Horror Stories, Sounds And Scares now also includes Pranks! The pranks are seemingly harmless games that will give players a good scare. It's perfect for getting a good laugh while your friends jump out their skin. 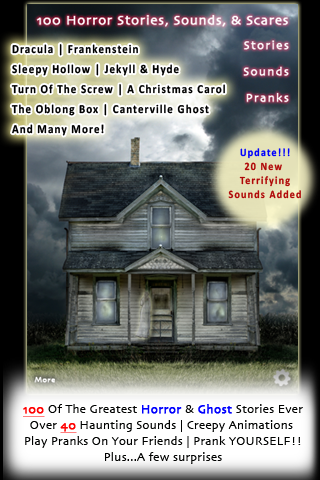 100 Horror Stories, Sounds, And Scares also includes 'AUTO-SCARE' which randomly plays sounds and scares at anytime making the app an even creepier experience!! Even if you're not reading, just leave the app on for a scary atmosphere. 100 Horror Stories, Sounds, And Scares 4.2 is only $0.99 (USD) and available worldwide exclusively through the App Store in the Books category. Review copies are available upon request. All future updates, including story and sound additions, are included with initial purchase.